If you are experiencing allergy like symptoms ( coughing, sneezing, itchy watery eyes, itchy ears, runny nose,etc) that don’t seem to be going away, please contact your local physician. You may have allergies that they can assist with. Seasonal allergies can be caused by small particles of dust, pollen, mold or other allergens entering you body as you breathe. Allergy symptoms and causes can vary, so it is important to know which symptoms to watch for, what you are allergic to an which medicines can help ease your symptoms. 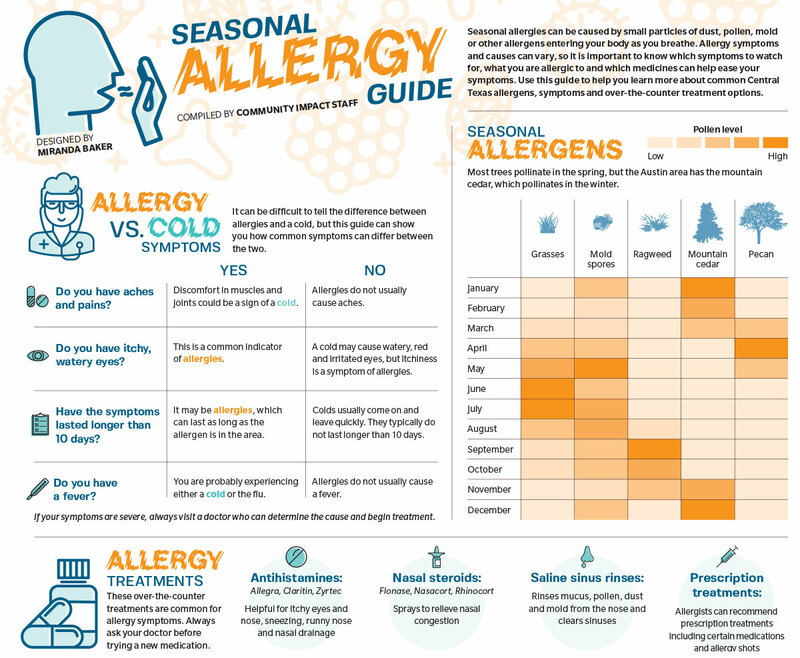 Use this guide to help you learn more about allergens, symptoms, & over the counter treatment options. Sources: central Texas allergy & asthma center, Texan allergy & sinus center/community impact newspaper.